Harbin "Red" Lawson was coach of basketball at the University of Georgia (UGA) from about 1951 to 1965. He was also director of intramural athletics at Georgia. 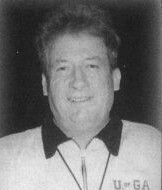 Coach Lawson occasionally refereed Bogart High School basketball games, primarily in November before the UGA schedule started in December. Bogart, GA is about eight miles west of Athens, GA and the UGA campus. I remember when I was in the 10th grade that Coach Lawson called a couple of games at Bogart High. On November 7, 1951, we played Oglethorpe County at home and Coach Lawson and Jitter Bug Smith were the referees. This was the first game of the season, one of my favorite games. We were so young and lacking in talent that everyone seem to be surprised that we won the game by a score of 45 - 42. I was 14 years old (soon to be 15 in a couple of months) and the smallest player on the court, about as tall as knee high to a grasshopper. During the third quarter, I was fouled and Coach Lawson handed me the ball at the foul line, smiled, leaned toward me, and softly said, "Bet you miss it". I'll never forget it. Bogart boys who played in that game were Dickey Oldham, Talmadge Harrison, Bill Wright, Stafford Garrett, Lamar Doster, Joe Nunnally, and me. Talmadge, Bill, Stafford, and Joe died over the past few years. I also remember that 6' 5" Henry Cabiness played in that game for Oglethrope County. He became the starting center for UGA in his college days under Coach Lawson. Henry Cabiness died about two years ago. Oh yeah, we also played the UGA freshman team that season at Bogart High. At that time, college freshmen could not play varsity sports in the NCAA. Therefore, universities in the NCAA had freshmen teams. In any event, UGA led us at half-time by a score of 25 to 23. Then, someone turned those puppy dogs loose and the final score was 60 - 40. Precious memories! We also played UGA again on January 27, 1953 when I was in the 11th grade. We lost that game something like 65 - 50, give or take a few points. Playing in that game were Donald Eades, Joe Nunnally, Lamar Doster, Tom Higginbotham, Stafford Garrett, Johnny Michael, Perry Michael, Johnny Wheeler, Charles Gunter, and me. Bill Wright, our starting center, was sick and did not play. I hope you understand my nostalgia. In a world that has lost its anchors, we need roots. Make sure your anchor withstands the storms.